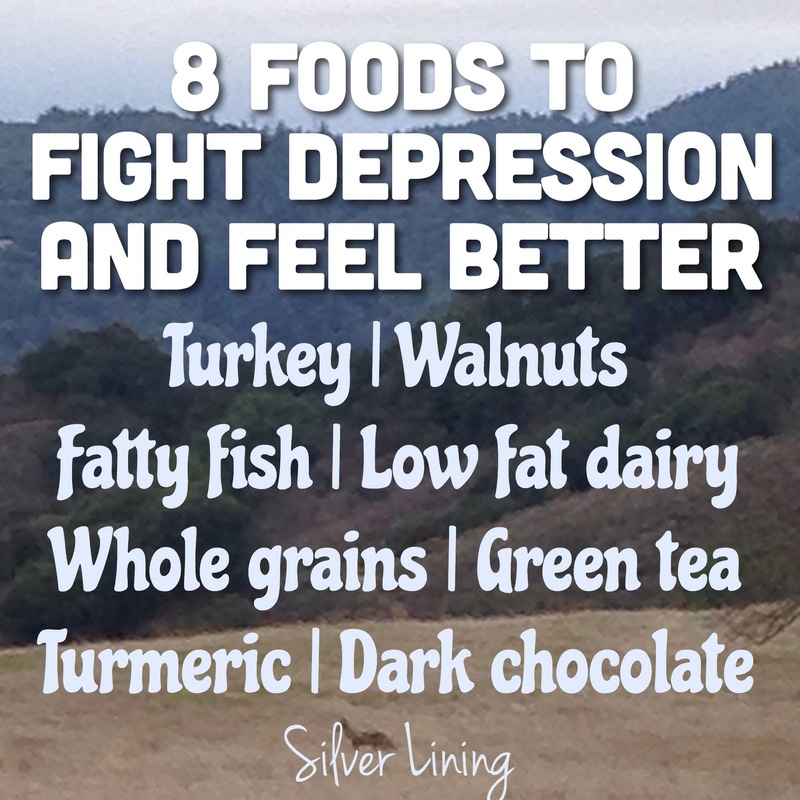 8 Foods to Fight Depression and Feel Better! I love eating. I also love being happy. Let’s eat and be happier! Walnuts: Walnuts are high in omega-3, which supports your overall brain health. Healthy brains equals a more healthy you! Fatty fish: Mackerel, tuna, salmon, and bluefish are all fatty fishes that are high in omega-3, which has certain properties that fight depression. It also improves your overall circulation and heart health. When you eat these yummy sea creatures, you decrease your overall risk for heart disease and gain a happy mind. Low fat dairy: Skim milk, yogurt (I love me some fro-yo), and low-fat cheese all have lots of calcium, vitamin D, and proteins that make you feel well and relaxed. Thank you cows for your wonderful feel-good milk. Whole grains: Fiber and complex carbs help release serotonin in the body, making you a happier person. Eat healthy, feel healthy, be happy. Green Tea: Antioxidants and theanine, an amino acid that promotes relaxation, make green tea the drink to drink! Skip the coffee and drink a cup of hot green tea instead. Turmeric: This lovely spice found in Indian and Asian curry dishes has anti-inflammatory properties, giving you a spice to life! Woo! I wish I came up with this pun… haha everydayhealth.com is pro. Dark Chocolate: Craving the yummy goodness of chocolate? On top of it’s taste-bud benefits, dark chocolate also releases serotonin and relaxes blood vessels. Feel guilt free as you break off a little piece of heaven. What are you waiting for? Head to your local supermarket or to your kitchen and fight that depression with your tummy. I’m proud of you. But remember to eat in moderation, or you will have to fight off a few pounds as well :). And if you’re not fighting depression, these foods also boost your mood! Categories: Tips | Tags: depression, feel better, food | Permalink. Aww haha I’m glad we could help 🙂 enjoy your chocolate!